We completed the CTD series and performed several additional lowerings in order to try to pinpoint dissolved methane sources around gas crater features. 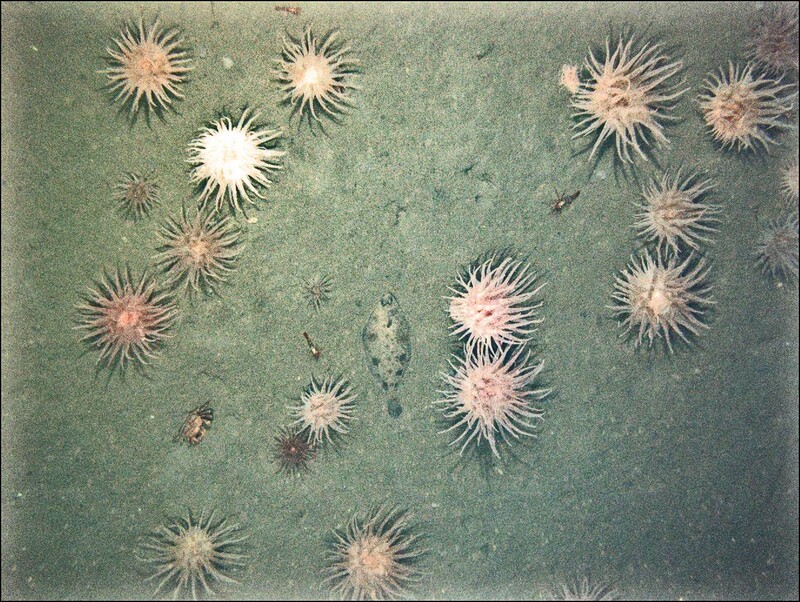 Some preliminary analysis of bottom photos taken on this cruise suggest that microbial mats, possibly fed by methane release, may represent a substantial source of productivity in bottom habitats that are clearly productive of monkfish and deep sea red crabs, and witch flounder, as well as non-resource species like longfin hake, all of which we saw in abundance. Large anemones (Bolocera tuediae and Actinauge sp.) are the most conspicuous structural species on most substrates, often at densities of several individuals per square meter. While these are neither deepwater corals nor sponges, they likely represent long-lived and readily damaged habitat structural species paralleling the role of corals and sponges elsewhere. We speculate that benthic decapod shrimp, which we also saw in considerable abundance, particularly where filamentous microbial fouling was evident, could form a link between microbial chemosynthetic production and deepwater fisheries production. We had a lot of difficulty with the onboard computer system in the MolaMola AUV. It kept rebooting itself unpredictably, which triggered an emergency surfacing routine. Once at the surface, the computer could be reset, but a lot of time was lost because both ascent and descent of neutrally buoyant MolaMola require powered vertical thrust. However, we managed one more successful dive on a hard bottom “buttress” feature along the eastern wall of Hudson Canyon, where we anticipated finding deepwater corals. These results are not yet available at the writing of this message. Mapping of tilefish bottom with ME70 proceeded in order to better define the local distribution of habitat of this resource species and its relationship to the topography and hydrology of the canyon. Two large areas were mapped, one west and one east of the canyon. The last dive of MolaMola photographed a few red crabs, but only through a blinding “blizzard” of marine snow: nearly white-out conditions in which we could barely see the bottom, even a close range. Marine snow is a common phenomenon in near-bottom waters caused by a dense concentration of white particulate matter, mainly organic in nature, suspended in the water. 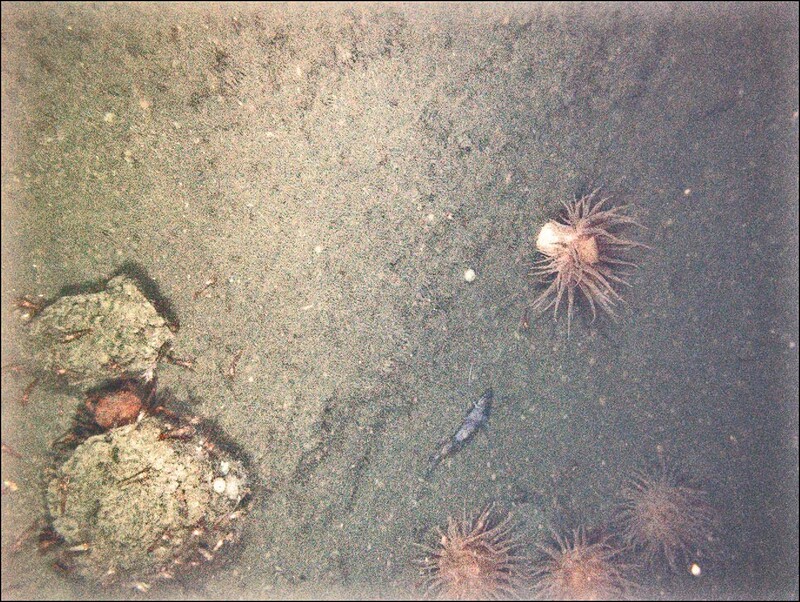 That we saw such an intense case of the phenomenon in this dive was itself of interest, as the marine snow material is a potential feast for bottom animals and microbes: a potentially important link in the canyon food chain. Henry B. Bigelow returned to port on Friday morning, August 12, completing the Hudson Canyon habitat mapping cruise. We launched Mola Mola early in the morning and despite a computer glitch that brought it up early, obtained some stunning bottom photos…much clearer than the ones we had gotten earlier because of far less marine snow in the water. Large anemones are everywhere in great numbers, apparently regardless of substrate type. They are on the rocks and equally abundant on the mud. Among them are large numbers of shrimp, which we did not see in the previous dive. Like previous dives we are seeing deep sea red crabs, hake (species uncertain), flat fish (probably witch flounder), and monkfish. On the acoustic front, we are close to producing a multibeam map of a portion of the tilefish habitat along the west side of the canyon. Single beam sonar continues to reveal a “wall effect” phenomenon in which plankton and fish aggregate along canyon walls centering around 200 m depth. 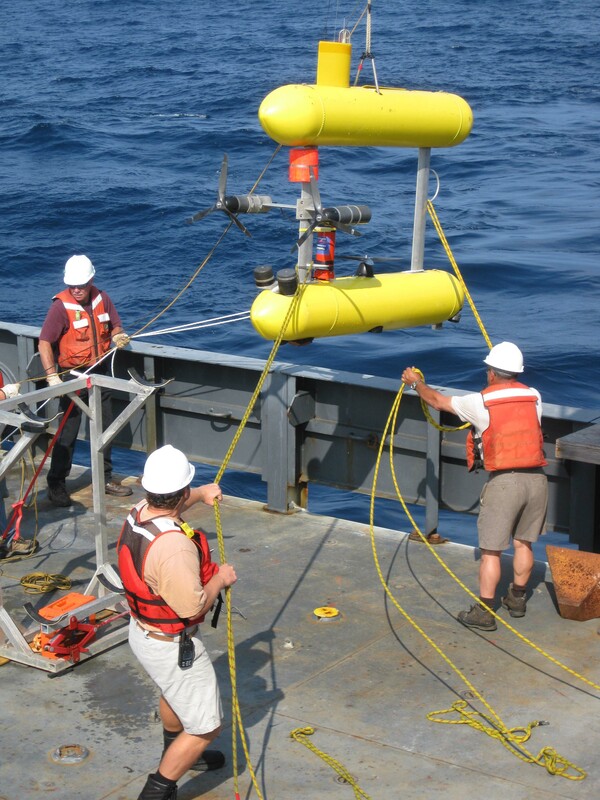 We performed still more CTD deployments with the rosette water sampler to search for the precise source(s) of dissolved methane that we had detected in deep water in the canyon in 2008 and 2009. The weather was very calm today, perfect for Mola Mola operations; it may begin to blow up a bit tomorrow, putting those ops in question tomorrow. We performed more CTDs overnight and obtained more water samples for methane and stable carbon isotope analysis, pausing only for an intense late-night thunderstorm. 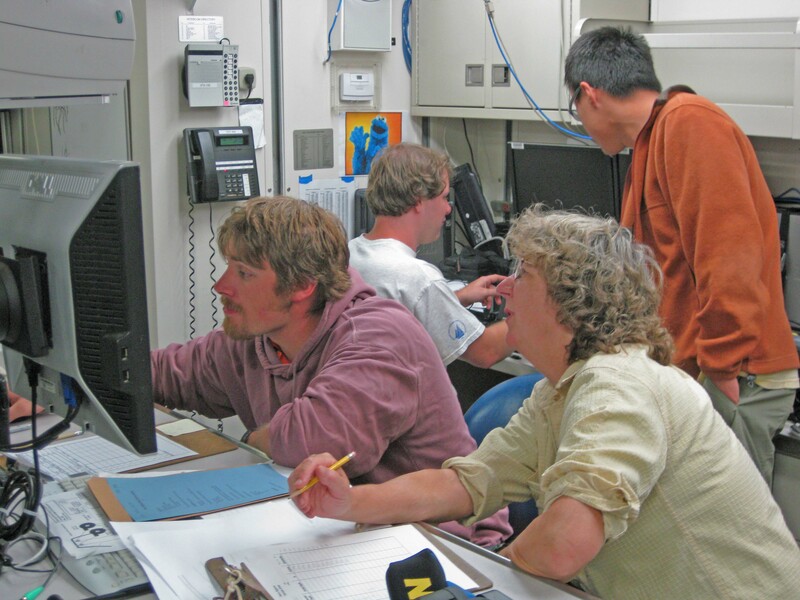 we then performed more ME70 lines in the tilefish habitat. Leo is still working on translating ME70 data for post-processing. The raw data from ME70 has a different format from all other Simrad products, and is therefore not directly useable with Caris HIPS, the post-processing program that Leo is using. Thus, as previously with ME70, we are collecting data “in the dark” without immediate feedback on quality or need for adjustment. This would not have been the case with the Bathy Option, which includes the software to create a cumulative image that can be examined for discrepancies. The breakdown of the installed on-loan Bathy Option just before the cruise has been a vexing problem, and we find ourselves having to work very hard to find a way around that problem, but we have not given up yet. As we were unable to operate Mola Mola because of weather yesterday, we were anxious to launch today. Despite the successful test run on Saturday, we had some problems with the AUV. A glitch in the onboard computer caused it to try to reboot repeatedly, which triggered it to surface as an automatic safety response. Hence, we got only a short dive in before having to recover the vehicle. The recovery proved very difficult in marginal sea conditions, and was very time consuming. We devised a new vehicle recovery scheme for tomorrow, but operations could not be continued. In place of Mola Mola operations, we began the hydrography watch early and got more CTDs done while also working out the computer problems with the AUV. Tomorrow (Tuesday) looks like the best day of the week for calm sea conditions, so we look forward to a great AUV mission on a rocky cliff area where deepwater corals are most likely to occur. In the meantime, I will be sending photos from our short dives thus far back to Sandy Hook, along with other materials explaining our mission. We again noted the apparent “wall effect” on water column organisms in the canyon: large aggregations visible at 18, 38, 120, and 200 kHz between 150 and 200 m over the walls of the canyon, but not over the shelf or over the thalweg (middle) of the canyon. Mola mola photos during descent and ascent show large concentrations of suspended matter, small fish and shrimp-like crustaceans in the water column, which may account for the acoustic phenomenon. Why they appear to concentrate over the sloping walls and not elsewhere is unclear. Weather today was sunny and warm, but the breeze made sea conditions difficult for work over the side, e.g. 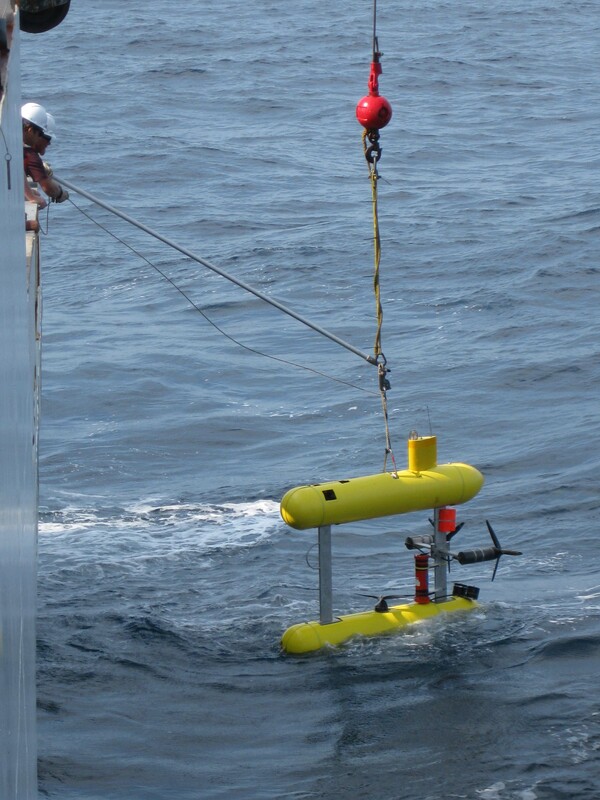 AUV recovery. After surveying in the bottom moorings for AUV navigation, we got the Mola Mola AUV in the water late yesterday for a short (45-minute) test run at around 450 m (roughly 1,475 feet) depth; it worked beautifully! 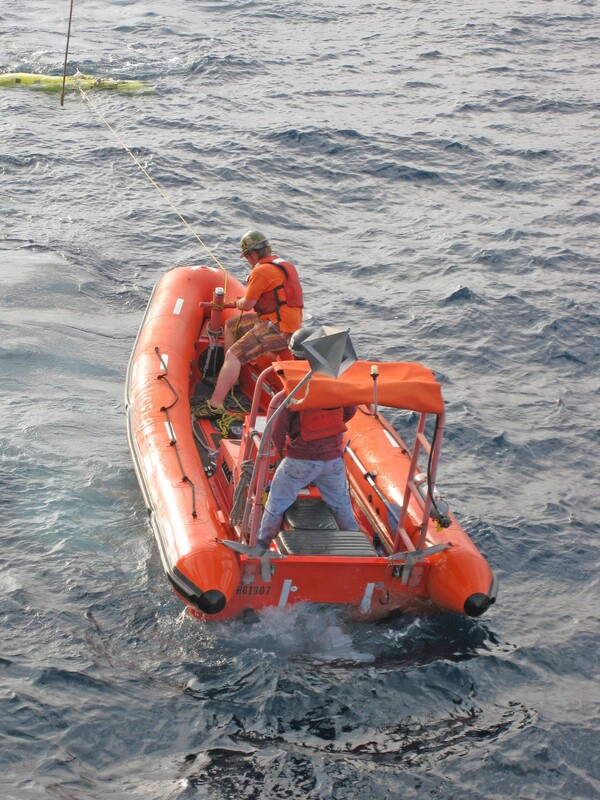 We obtained a stream of pictures from the bottom and we were able to retrieve it with the ship’s inflatable rescue boat with little trouble when it surfaced. The pictures were great, but no corals yet (wrong kind of bottom). It was flat and muddy and we saw numerous of deep sea red crabs, witch flounders, merluccid hake, monkfish, and a high density of large (probably up to 15 cm diameter) non-burrowing anemones (Bolocera and an unidentified species). They appear to be a major structuring species, but it’s a mystery what they’re attached to; there’s no obvious hard substrate…just flat mud. We were very anxious to do a 6-hour “production run” with Mola Mola today, but the weather has blown up a bit and it’s not safe for the small boat operations necessary to retrieve the AUV. The high freeboard of Henry Bigelow is a disadvantage, as it prevents us from retrieving directly onto the ship. Thankfully the seas are supposed to lay down tomorrow and for a few days thereafter, so we’ll have something to show the Deep Corals Workhop participants at Sandy Hook. 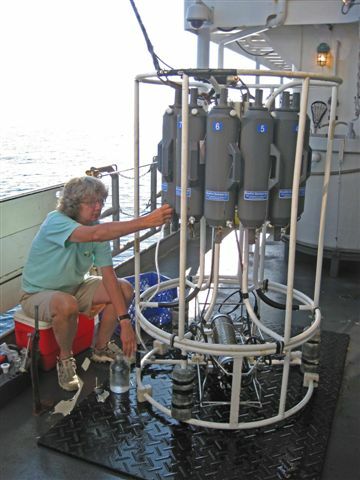 Mary Scranton collects water samples from the rosette water sampler (Credit: Peter Rona, Rutgers University). Overnight we took a number of CTDs in the canyon and collected samples for stable carbon istopes as well as for methane analysis and phosphate. Isotopic ratios in the elevated dissolved methane in deep water can point to the origin of the methane (gas pockets vs. ice hydrates vs. newly decayed). As we expected, we are seeing the coldest bottom temperatures (7 degrees C, or 44 degrees F) at shelf depths and in the upper canyon now in August: it is normally warmer (up to 12 C, 0r 54 degrees F) in January during LMRCSC cruises. ME70 (Fisheries Mode). We were advised to do this by Leonardo Macelloni (U. Mississippi: onboard). Without the software in the now defunct Bathymetric Option we can not use this data to autocorrect incoming multibeam signals, but Leo says he can use it to correct data in post-processing. Since we cannot use Mola Mola today we are running ME70 lines through the tilefish habitat area to document the extent of the typically hummocky burrowed bottom terrain. ME70 works well in 120-150 m depth, but because of its relatively high frequency (~90 kHz), we could not use it to map the final southern third of the canyon that we have not yet been able to do with the NIUST Eagle Ray AUV (not onboard this year). ME70 seems to be working well and I hope to get some interesting results from it despite the lack of the Bathy Option, though we’re just lucky we’ve got Leo with his expertise aboard this time, or we’d be “dead in the water” so to speak. On another acoustic note, we’ve been watching the EK60 multi-frequencysingle beam sonar and have noted this morning that a “cloud” of organisms visible at 18, 38, 120, and 200 kHz (the 70 kHz has been displaced by an NIUST acoustic modem) hangs over the canyon walls at about 150-200 m (roughly 500 – 650 foot) depth no matter where we cross the walls. I wish we had nets (and time) to sample this and figure out what’s going on. No whales yet today. aboard Henry Bigelow. Until last night it was sunny, breezy, and warm but not really hot and nearly calm. Now we’ve got showers and a gentle roll. Everybody seems fairly comfortable. Hudson Canyon, Here We Come! We had a pre-cruise meeting on board to work out the details of our operations and coordinate among our three research objective teams (AUV ops, hydrography, and sonar ops) and with the ship’s crew on Friday morning (August 5), then departed Newport aboard Henry Bigelow at 3 PM. Our first mission was to conduct a half-hour calibration session with the NIUST Mola Mola AUV in Rhode Island Sound…just to align its sensors, before heading for our operations area in Hudson Canyon. We arrived at 3 AM on Saturday, August 6, and began performing CTD-rosette sampling at the northern end of Hudson Canyon. Once dawn broke, we headed south to begin placing and surveying in bottom moorings at about 650 m depth (roughly 2,133 feet deep) that will provide acoustic positioning beacons for long baseline navigation of the AUV and collect CTD and ADCP data. All of that has gone smoothly so far. We still have to do a couple of test dives with Mola Mola to adjust its buoyancy and check the function of its photographic system. All has gone smoothly so far. We are all very excited about the prospects of this cruise, as our bottom photography is likely to reveal deepwater corals and sponges and cold seep (chemosynthetic) communities. Potential locations of these were pinpointed as the result of our efforts to create ultra-high-resolution multibeam sonar maps of the canyon since 2007. “We” refers to our collaborative scientific PIs (principal investigators): me, Peter Rona (Rutgers), Arne Diercks (NIUST), Leonardo Macelloni (Ole Miss), and Mary Scranton (Stony Brook). Not such good news on the proposed ME70 Bathymetric Option test. Something went wrong with the Bathy Option system just before we left. The ship’s Survey Techs and ET did a lot of work to track down the problem, only to discover a burned-out power supply. We would need a new one from Simrad to get the Bathy Option running. In other words, we cannot use the Bathy Option on this cruise, although ME70 is still functioning in the Fisheries mode. We can still perform the survey of part of the tilefish habitat as planned, but will not be able to perform the comparative test with the Bathy Option as originally envisaged. The weather is great: clear, calm, and sunny, but we don’t know what Emily is up to over the southern Horizon. It broke up over Hispaniola, but may be reforming. We have seen more marine mammals today than I have ever seen before at sea: pilot whales, fin whales, and dolphins… everywhere. Sightings are nearly continuous.